All of your backcountry lighting needs are met with this 3 piece kit from Princeton Tec. The Sync Headlamp gives you hands-free lighting on the go, the Helix Backcountry Lantern gives plenty of light in camp and the Amp 1L flashlight covers any lighting needs in between. Sync Headlamp Evolving the next generation of the Family series was no easy task. 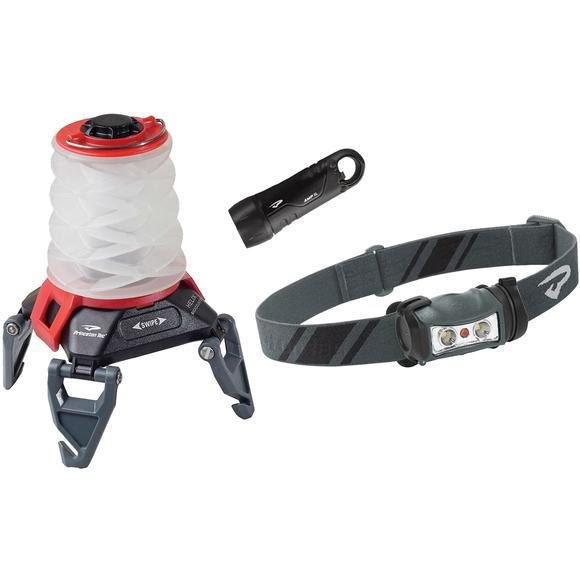 All of your backcountry lighting needs are met with this 3 piece kit from Princeton Tec . The Sync Headlamp gives you hands-free lighting on the go, the Helix Backcountry Lantern gives plenty of light in camp and the Amp 1L flashlight covers any lighting needs in between. Evolving the next generation of the Family series was no easy task. When developing the Sync they started with the proven foundation of their stable asymmetrical single arm bracket, integrated essential modes to please a wide variety of discerning users, and tied it all together with an easy to use interface. Sync allows direct access to a red LED, spot beam, and flood beam by a twist of the power dial. For those times that require max output a further rotation of the dial activates Dual-beam mode: spot and flood at the same time. It sure is nice to bring along a few creature comforts even when you&apos;re headed way out there. Helix Backcountry is a compact, lightweight lantern which puts out a bright beam that&apos;s easy on the eyes, making it perfect for around camp or in your tent. Helix Backcountry has a unique control surface that is free of buttons, yet gives access to a 150 lumen white mode, dimmable to 30 lumens, as well as a dimmable red mode for low profile use. The expanding globe and folding legs help Helix Backcountry to shine over a wide area. The lantern design also incorporates several hanging options. The tiny Amp 1L packs a 90 lumen LED. With a large carabiner loop, this handheld light can hang off of a gear loop on your pack or the inside of your tent. When the adventure is over, this light still comes in handy with its built-in bottle opener. Amp 1L is waterproof to 100M (330ft). The highest quality LEDs available, the Ultrabright and Maxbright LEDs are bright and efficient. The smooth, white, wide-beam light emitted by these LEDs is ideal for close to mid-range tasks. These LEDs are usually grouped together to offer a more powerful light source. Advances currently underway will continue to improve the efficiency and brightness of Ultrabright LEDs.